Southlake, TX -- As the Fall sports season reaches its conclusion, many adult, adolescent and child athletes are playing with seemingly normal but persistent foot pain that could be a sign of a more serious injury, according to Dr. Suttle, a member of the American College of Foot and Ankle Surgeons (ACFAS). "Playing with pain often is viewed as a badge of honor among athletes, but they must be aware that the persistent pain they dismiss as normal exercise-related stress could be something far more serious," said Dr. Suttle, whose office is in Southlake, TX. Dr. Suttle said athletes of all ages visit her office with foot pain due to overuse injuries from repetitive loading of the foot and ankle during running and aerobics. "When athletes overdo their workouts, it may be normal to experience some temporary discomfort," said Dr. Suttle. "But if pain continues longer than a few days with continued redness, warmth or swelling, the athlete should see a podiatric foot and ankle surgeon for proper diagnosis and advice on treatment options." Athletes who ignore persistent foot pain and inflammation and continue to train risk potential complications that could sideline them for months. 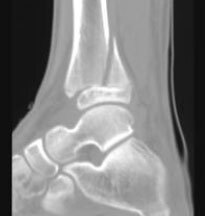 Among possible injuries associated with persistent foot and ankle pain are stress fractures, muscle strains, tendonitis and subtle fractures after inversion ankle sprains. "Stress fractures sometimes aren’t debilitating and some athletes might continue their normal training despite the injury," said Dr. Suttle. "But continual rigorous activity can worsen the problem. An examination and diagnosis by a foot specialist can determine whether the pain is from overuse or subtle trauma, requiring only a few days of rest, or something that may require surgical intervention." Heel pain in children often is caused by injuries to the growth plate and secondary growth centers in which tendons pull at the top and bottom of the growth plate of the heel. Boys and girls ages 8 to 14 are susceptible to this problem, and its major symptom is pain on either side of the heel. "Growth-plate trauma is common in soccer and other sports that involve a lot of running," said Dr. Suttle. "Parents should make sure that their children stretch before playing and apply ice to the back of the heel after the game or practice. In some cases, anti-inflammatory drugs and shoe inserts or lifts are recommended, but the potential for recurrent injury exists until the growth plate closes," she explained. Running or playing surfaces: Athletes who train on asphalt or cement are more prone to stress injuries than those who run on cushioned tracks or natural grass fields. Shoes: Footwear should be appropriate for the sport and match the biomechanics of the individual’s foot. For example, those who engage in one sport more than three times a week should wear athletic shoes designed for the sport, and shoe technology has advanced to allow for variances in foot characteristics that require stability cushioning. Training: Injuries often result when athletes fail to build up to a desired training goal. Accordingly, a runner shouldn’t set a goal of 20 miles a week without gradually progressing to that goal. Behavioral factors: In children, overuse injuries sometimes occur from excessive parental pressure to achieve in sports. 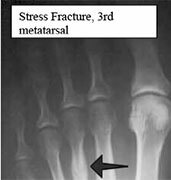 Nutrition: Stress fractures can occur in athletes with poor nutritional habits. Over-training: Sleeping problems and resultant irritability and fatigue are common among some athletes who exercise aggressively. Physical characteristics: Variations in bone structure and muscle development are evidenced in individuals who are bowlegged or have malalignment problems. Because the growth plates at the end of a child's long bones are the last portion to harden, they are susceptible to fractures. It is very important that parents take a child to an orthopedic physician if there is the possibility that their child may have suffered this type of fracture. Children who either do not receive treatment or get insufficient treatment for growth plate fractures may end up with a crooked or uneven limb. A variety of factors, including participation in a sport that require repetitive motion, poor footwear, or a sudden increase in a child's level of activity can result in painful stress fractures. Sprains refer to ligaments that have been torn or stretched, while strains refer to muscles that have suffered these types of injuries. Ankles and wrists are the most common body parts to be sprained. Sports, such as football and basketball, that involve a lot of turning and twisting can be hard on young knees. According to Science Daily, tears of the anterior cruciate ligament (ACL) and meniscus, which are located in the knees, have increased dramatically in children in recent years. Children who complain of anterior knee pain while running, kneeling or jumping may have OSD. This condition most commonly affects children who participate in sports such as soccer, basketball and volleyball. This problem is caused when a piece of cartilage and a thin layer of bone break loose and then gets caught between moving joints. 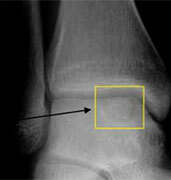 In children, OD is most commonly seen in the knees and ankles. This is a painful heel condition that commonly affects children. Severs Disease is caused by inflammation of the growth plate in a child's heel, and it typically occurs during the growth spurt that occurs during early puberty. For more information on foot and ankle pathology, please visit www.texasfootdoctor.org. For more information on foot conditions affecting athletes and children, go to FootHealthFacts.org.